This article is about the region in California. For the region in Washington and Idaho, see Inland Empire (Pacific Northwest). For other uses, see Inland Empire (disambiguation). The Inland Empire (IE) is a metropolitan area and region in Southern California. The term may be used to refer to the cities of western Riverside County and southwestern San Bernardino County, sometimes including the desert communities of Palm Springs and the rest of the Coachella Valley; a much larger definition includes all of San Bernardino and Riverside counties. The U.S. Census Bureau-defined Riverside–San Bernardino–Ontario metropolitan area, which comprises Riverside County and San Bernardino County, California, covers more than 27,000 sq mi (70,000 km2) and has a population of approximately 4 million. Most of the area's population is located in southwestern San Bernardino County and northwestern Riverside County. 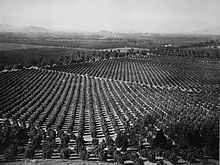 At the end of the nineteenth century, the Inland Empire was a major center of agriculture, including citrus, dairy, and winemaking. However, agriculture declined through the twentieth century, and since the 1970s a rapidly growing population, fed by families migrating in search of affordable housing, has led to more residential, industrial, and commercial development. The term "Inland Empire" is documented to have been used by the Riverside Enterprise newspaper (now The Press-Enterprise) as early as April 1914. Developers in the area likely introduced the term to promote the region and to highlight the area's unique features. The "Inland" part of the name is derived from the region's location, about 60 miles (97 km) inland from Los Angeles and the Pacific Ocean. Originally, this area was called the Orange Empire due to the acres of citrus groves that once extended from Pasadena to Redlands during the first half of the twentieth century. The Inland Empire is a nebulous region, but is defined as the cities of western Riverside County and the cities of southwestern San Bernardino County; adjacent to the Los Angeles metropolitan area. A generally broader definition will include the desert community of Palm Springs and its surrounding area, and a much larger definition will include all of San Bernardino and Riverside counties. What is now known as the Inland Empire was inhabited for thousands of years, prior to the late eighteenth century, by the Tongva, Serrano, and Cahuilla Native Americans. With Spanish colonization and the subsequent Mexican era the area was sparsely populated at the land grant Ranchos, considering it unsuitable for missions. The first American settlers, a group of Mormon pioneers, arrived over the Cajon Pass in 1851. 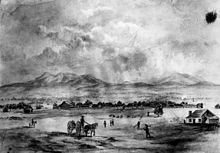 Although the Mormons left a scant six years later, recalled to Salt Lake City by Brigham Young during the church's Utah War with the US government, other settlers soon followed. The entire landmass of Southern California was subdivided according to the San Bernardino Meridian, which was first plotted as part of the Public Land Survey System in November 1852, by Col. Henry Washington. Base Line road, a major thoroughfare, today runs from Highland to San Dimas, intermittently along the absolute baseline coordinates plotted by Col. Washington. San Bernardino County was first formed out of parts of Los Angeles County on April 26, 1853. While the partition once included what is today most of Riverside County, the region is not as monolithic as it may sound. Rivalries between Colton, Redlands, Riverside and San Bernardino over the location of the county seat in the 1890s caused each of them to form their own civic communities, each with their own newspapers. On August 14, 1893, the state Senate allowed Riverside County to form out of land previously in San Bernardino and San Diego counties, after rejecting a bill for Pomona to split from L.A. County and become the seat of what would have been called San Antonio County. The arrival of rail and the importation of navel and Valencia orange trees in the 1870s touched off explosive growth, with the area quickly becoming a major center for citrus production. This agricultural boom continued with the arrival of water from the Colorado River and the rapid growth of Los Angeles in the early twentieth century, with dairy farming becoming another staple industry. In 1926, Route 66 (now known as Foothill Boulevard and Interstate 215) came through the northern parts of the area, bringing a stream of tourists and migrants to the region. Still, the region endured as the key part of the Southern California "citrus belt" until the end of World War II, when a new generation of real-estate developers bulldozed acres of agricultural land to build suburbs. The precursor to the San Bernardino Freeway, the Ramona Expressway, was built in 1944, and further development of the freeway system in the area facilitated the expansion of suburbs and human migration throughout the Inland Empire and Southern California. The region experienced significant economic and population growth through most of the latter half of the twentieth century. In the early 1990s, the loss of the region's military bases and reduction of nearby defense industries due to the end of the Cold War led to a local economic downturn. The region as a whole had partially recovered from this downturn by the start of the twenty-first century through the development of warehousing, shipping, logistics and retail industries, primarily centered around Ontario. However, these industries have been heavily affected by the Great Recession. Physical boundaries between Los Angeles and the Inland Empire from west to east are the San Jose Hills splitting the San Gabriel Valley from the Pomona Valley, leading to the urban populations centered in the San Bernardino Valley. From the south to north, the Santa Ana Mountains physically divide Orange County from San Bernardino and Riverside Counties. The Santa Rosa Mountains, as well as the Southern California portion of the Sonoran Desert, physically divide Riverside County from San Diego County. Some definitions for the IE consist of the Chino Valley, Coachella Valley, Cucamonga Valley, Menifee Valley, Murrieta Valley, Perris Valley, San Jacinto Valley, Temecula Valley, and Victor Valley. Elevations range from 11,499 ft (3,505 m) at the top of the San Gorgonio Mountain to −220 ft (−67 m) at the Salton Sea. The San Bernardino mountains are home to the San Bernardino National Forest and the resort communities of Big Bear Lake, Lake Arrowhead, and Running Springs. The Santa Ana River extends from Mt. San Gorgonio for nearly 100 miles (160 km) through San Bernardino, Riverside, and Orange counties before it eventually spills into the Pacific Ocean at Newport Beach and Huntington Beach. While temperatures are generally cool to cold in the mountains, it can get hot in the valleys. In the desert resort of Palm Springs, near Joshua Tree National Park, summer temperatures can reach well over 110 °F (43 °C). Unlike most metropolitan areas that have grown up around a central city, the Inland Empire has no one main focus city. Major cities in the region include Riverside, San Bernardino, Rancho Cucamonga, and Ontario. Suburban sprawl spreads out to form a unified/built up connection with the Los Angeles metropolitan area. Further development is steadily, if not heavily, encroaching past the mountains into the outlying desert areas. The Inland Empire borders both Los Angeles and Orange counties. Freeways in Southern California are heavily used, but this comprehensive freeway system has made travel between the Inland Empire and these two counties generally easy, especially to and from Los Angeles County. The Inland Empire has also been referred to as the 909, after one of the region's most used area codes. In 2004, because of growing demand for telephone numbers, most of Western Riverside County was granted a second area code, 951, which is overlayed with the 909 area code (they have the same physical boundaries and new teleophone subscribers likely receive a 951 area code telephone number) . The Coachella Valley region of Palm Springs, Palm Desert, and Indio are located much further east in Riverside County (the distance between the city of San Bernardino and Palm Springs is approximately 45 miles) and is part of the much larger 760 area code. This area is sometimes considered a sub-region of the Inland Empire or its own separate region. This is to help differentiate them from the urbanized area of San Bernardino-Riverside. There is no universally accepted definition for the boundaries of the Inland Empire region. Some sources such as the Los Angeles Times have referred to Riverside County and San Bernardino County as the Inland Empire, mirroring the Riverside-San Bernardino-Ontario metropolitan area. Some residents of certain areas within the three counties, such as Twentynine Palms, the Coachella and Temecula valleys, may consider themselves separate from the IE. The California Travel and Tourism Commission (CTTC), a not-for-profit, nongovernmental entity that promotes tourism in California, divides the state into several regions for its own purposes. The CTTC defines the Inland Empire as being bounded by Los Angeles County and Orange County on the west, San Diego County on the south, as far north as the Victor Valley area, and as far east as Idyllwild in the San Jacinto Mountains. The state of California's official website links to the CTTC's map with the description "Map of the Inland Empire region". Inexpensive land prices (compared with Los Angeles and Orange Counties), a large supply of vacant land, and a transport network where many highways and railroads intersect have made the Inland Empire a major shipping hub. Some of the nation's largest manufacturing companies have chosen the Inland Empire for their distribution facilities including Toyota Motor Corporation's North American Parts and Logistics Distribution (NAPLD) center in Ontario and APL Logistics in Rancho Cucamonga. Whirlpool Corporation recently leased a 1,700,000-square-foot (160,000 m2) distribution center in Perris that is larger than 31 football fields and one of the biggest warehouses in the country. These centers operate as part of the system that transports finished goods and materials from the ports of Los Angeles and Long Beach to destinations to the north and east such as Las Vegas, Phoenix, and Denver. More than 80 percent of the state's imported cargo is shipped through the Los Angeles/Inland Empire Corridor. However, with the global economic downturn, industrial vacancies have doubled from 6.2 percent in 2007 to 12.4 percent to 2008. In San Bernardino and Redlands, vacancies are as high as 22 percent. Although the region's large industries have been affected by the Great Recession, the Inland Empire is projected to remain California's fastest-growing region for some time to come. The area is also projected to remain one of the least educated areas of the state with the lowest average in annual wages in the country. A 2006 study of salaries in 51 metropolitan areas of the country ranked the Inland Empire second to last, with an average annual wage of $36,924. However, inexpensive land prices and innovative institutional support networks have attracted some small businesses and technology startups into the area. While urbanization continues to cut into agricultural lands, the Inland Empire still produces substantial crops. Although 10,000 acres (40 km2) of irrigated land was lost between 2002 and 2004, agriculture still brought in more than $1.6 billion in revenues to the two-county region in 2006. Being a MSA, aggregate GDP figures are reported by the Bureau of Economic Analysis annually. The Inland Empire ranks 25th in the nation with a 2011 GDP of $109.8 billion, roughly a third of San Francisco-Oakland-Fremont, CA MSA despite their close population numbers. Per capita GDP was $25,993.34 in 2011, nearly half among the nation's top 50 Gross Metropolitan Product. Due to housing crisis, the GDP fell from $114.8 billion in 2007, despite a heavy influx of residents. The unemployment rate in the Inland Empire has been consistently over the national average since 2007. 10.4 percent of Inland residents were unemployed as of August 2013, compared with the national rate of 7.3 percent. Due to the high unemployment and housing foreclosure rates, a higher percentage of Inland residents rely on public assistance. According to the Press-Enterprise, "twelve percent of Riverside County and 17 percent of San Bernardino County residents used food stamps in January 2012," as compared with "11 percent of those living in Los Angeles County, 8 percent of San Diego County residents and 7 percent of Orange County residents." Housing construction visible from the air in Fontana. Since 1980, the city's population has grown by 150,000. Since the 1950s, the area has changed from a rural to a suburban environment. The region now comprises numerous cities known as bedroom communities that are suburban cities to Los Angeles. Affordable home ownership is the primary motivation behind the growth in these Inland Empire cities as homes in the region are generally less expensive than comparable homes in Los Angeles and Orange counties. The steady rise in population and the demand for housing has led to a dramatic increase in the building of single-family homes on parcels of 0.25 acres (1,000 m2) or more, as opposed to the construction of high-density development such as multi-story apartment or condominium buildings. This low-density development has caused sprawl in the Inland Empire; a commute between Beaumont and Ontario is approximately 43 miles. Much of the vacant land is being developed. Land that was used for agriculture is now being sold by owners for conversion to shopping centers, industrial warehouses, etc. 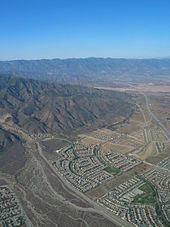 Due to the lack of the Inland Empire having just one central city, and the smaller geographical footprint that suburban cities tend to have, this continuous development has become seemingly unplanned suburban sprawl as local interest and zoning laws may quickly change from one city to the next city. 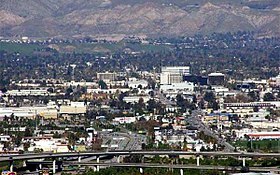 The Inland Empire was declared the nation's worst example of sprawl according to a study by Smart Growth America in 2002. During the housing bubble collapse of the late 2000s, foreclosures rose by 3,500 percent. In 2010, the area ranked fourth in the nation in the number of foreclosures, with one filing for every 133 households. The problem of abandoned homes became so great that the city of Perris initiated a program to paint the brown lawns of abandoned homes green as a way to cut down on the appearance of blight. Retailing in the area has increased to try to keep abreast with the growing suburban population. The region is home to several large shopping malls, including the Promenade Shops at Dos Lagos and the Crossings in Corona; Ontario Mills in Ontario; Promenade Mall in Temecula; Galleria at Tyler, Riverside Plaza, and Canyon Crossings in Riverside; The Shoppes at Chino Hills in Chino Hills; Moreno Valley Mall in Moreno Valley; Victoria Gardens in Rancho Cucamonga and the Inland Center mall in San Bernardino. In fiscal year 2006, retail sales in San Bernardino County grew by 11.9 percent to $31.2 billion, while sales in Riverside County were up 11.3 percent to $29.6 billion. The Inland Empire is subject to smog conditions on a regular basis as seen here, looking south, from the north terminus of Haven Avenue in Rancho Cucamonga. Note how the street 'fades' into the smoggy haze and the Santa Ana Mountains are completely obscured. The Inland Empire is also subject to Santa Ana Winds that lead to generally clear days, free of smog or the marine layer. Note how the street that 'faded' into the smoggy haze and the Santa Ana Mountains that were completely obscured in the adjacent image are now visible. The result of this ongoing development has resulted in greater homeownership for the region. Although the region saw an uptick in jobs over the past decade, it is not a heavy employment center, and many residents commute to Los Angeles and Orange counties for their work. With a lack of substantial public transportation in the Greater Los Angeles Area, this has led to traffic congestion and degradation in air quality for the Inland Empire. The solution to these problems is not simple. The presence of so many city governments within the Inland Empire, which often have different 'visions' for their own municipalities, means that two cities in the region rarely agree on a solution; just as common, they may have unequal means for implementing one even if they were to agree. Having no regional-wide governmental planning organization may undermine any solution that could be proposed. Lastly, the pace at which development occurs (fast) versus the ability of government to respond to changes (slow) means that it could easily take years, if not decades, for a viable solution (such as new roads, pollution controls, etc.) to go into effect. Air pollution, or suspended particulate matter locally generated from the increased number of automobiles in the area, from point sources such as factories, dust carried into the air by construction activity, and the contribution of similar pollutants from the Los Angeles area has regularly caused the Inland Empire to be at, or near, the bottom of many air quality ratings. In 2004, the EPA rated the San Bernardino-Riverside area as having the worst particulate air pollution in the United States (although the San Joaquin Valley in central California had the worst overall air pollution). Air pollution in the Los Angeles region is still an issue, although improvements have been made over the years. But the problem is exacerbated in the Inland Empire, which is surrounded by mountains on the north and the east. Prevailing winds move bad air eastward from Los Angeles, but once the pollution reaches the Inland Empire it cannot be carried further east as it becomes trapped by the mountains surrounding the region. Water pollution has also been found in the Santa Ana River and Cajon wash, and pollutants from the March Air Reserve Base and Stringfellow Acid Pits have contaminated groundwater in parts of Riverside County. In 1997, perchlorate, a chemical used to produce explosives, was discovered to be seeping into the groundwater under Rialto in a plume that continues to grow. In 2007, the Rialto City council petitioned the United States Environmental Protection Agency (EPA) for Superfund status to clean up the origin site. The sites comprising March Air Reserve Base, Norton Air Force Base and the Stringfellow Acid Pits have already been classified as EPA Superfund toxic waste sites. 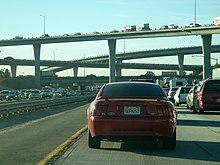 Traffic congestion problems on the roadways, as with elsewhere in Southern California, are the result of the demand for driving exceeding the available capacity, especially on area freeways. Many of the existing freeways were completed in the late 1970s, with the exception of the segment of the Foothill Freeway, State Route 210 (SR 210) between San Dimas and San Bernardino completed in July 2007. New freeways or highway "fix-ups" are being planned, such as the construction of Mid County Parkway between Perris and San Jacinto or the addition of toll lanes on I-15 through heavily urbanized portions of Riverside and San Bernardino counties. However, other problems exist, one being the jobs vs. housing imbalance. The Inland Empire population grew as a result of affordable housing, at least relative to the rest of Southern California, but most of the higher paying jobs are located in Los Angeles, San Diego and Orange counties. Thus, many workers must commute daily from the Inland Empire to their jobs in these counties—sometimes up to two hours each direction—and even longer if by public transportation. As the population increases, the problem is most certainly going to get worse. Forbes magazine recently ranked the area first in its list of most unhealthy commutes in the United States, beating out every other metropolitan area in the country, as Inland area drivers breathe the unhealthiest air and have the highest rate of fatal auto accidents per capita. According to a 1999 report by the Surface Transportation Policy Project, the Inland Empire leads in fatal crashes caused by road rage. The theft of copper, brass and other metals from highway and road fixtures has also led to decreased public safety on IE roads and freeways. Gas siphoning has also been noted as a problem for vehicles left unattended in the region. sbX Green Line's Civic Center Station in downtown San Bernardino. sbX Hospitality West Station, downtown San Bernardino. Unlike many major metropolitan areas, the Inland Empire has minimal public transportation. When combined with the large physical size of the region, more people use automobiles for convenient travel. Less than five percent of the IE's 1,249,224 working-age residents use public transportation to get to work. Omnitrans is the largest bus agency in San Bernardino County, while the Riverside Transit Agency is the largest in Riverside County. Currently, some of Omnitrans' bus routes run 1–2 hours apart, and some routes stop service in the early evening or may not run on weekends. The metropolitan area's first rapid transit line, a new bus rapid transit system, launched in April 2014. The new line, dubbed San Bernardino Express (sbX), offers rapid transit service that functions just like light-rail with center running stations, designated sbX lanes and passengers purchasing tickets prior to boarding. Stations are approximately one mile apart with its northern terminus in Verdemont and southern terminus in Loma Linda's VA hospital, passing through downtown San Bernardino and the city's Hospitality Lane Business District. Several airports are located in the Inland Empire. Ontario International Airport and Palm Springs International Airport are commercial airports in their respective cities. A local joint powers agency is attempting to redevelop the decommissioned Norton Air Force Base into San Bernardino International Airport. The airport currently serves as a general aviation airport. Over 20 years after decommissioning, discount airline Volaris announced in April 2017 that it would begin commercial service at San Bernardino in June 2017. There are also several general aviation airports in the region. The region is making some progress in developing dedicated bicycle commuter and recreation trails. The largest of these, the Santa Ana River bicycle path, currently connects Corona to Huntington Beach, and is eventually projected to stretch for 84 miles all the way to Redlands when completed in 20 years. A shorter trail exists along the former path of the Pacific Electric Railway from Claremont to Fontana. The population of the Greater Los Angeles area (which includes the Inland Empire) is about 18 million people according to the 2010 United States Census, and is the second largest metropolitan region in the country. The Metropolitan Statistical Area population of the Inland Empire (Riverside-San Bernardino-Ontario, CA Metropolitan Statistical Area) onto itself is over 4.2 million people and is the 13th largest metropolitan area in the United States. According to the 2000 U.S. Census, it is the fastest growing area in the state. Between 1990 and 2000, Riverside and San Bernardino counties added 700,000 to their population totals, an increase of 26 percent. Between 2000 and 2010 Inland Empire's population expanded by 970,000 or 30 percent. According to census bureau's 2005–2007 estimates 61.8 percent of the population was White (40.4 percent White Non-Hispanic), 7.5 percent Black, 5.7 percent Asian and 25.0 percent of other or mixed race. 43.9 percent were Hispanic of any race. 21.9 percent of the population was foreign born. The Centers for Disease Control and Prevention reports that in 2006, 33.1 percent of people in the Greater San Bernardino Area were overweight, and 30.8 percent were obese. Forbes magazine ranks the area as the fourth fattest in the country. A substantial majority of residents (76.6 percent), last comparatively surveyed in 2001, rated their respective counties as good places to live. Over 81 percent of Riverside County residents indicated that their county is a very good or fairly good place to live, while about 72 percent of residents in San Bernardino County felt the same way. Survey respondents cited "nice living area," "good climate," and "affordable housing" as the top positive factors in assessing their respective communities. Smog was by far the most important negative factor affecting respondents’ ratings in both counties, while traffic was the second highest concern in Riverside County and crime the second highest concern among San Bernardino County residents. Since the 1970s and onwards, large numbers of African-American, Latino and some Asian-American residents from the Los Angeles-Orange County and San Diego metro areas moved to the Inland Empire region. Large Black communities can be found around San Bernardino (Fontana and Rialto) and Riverside (Moreno Valley and Perris), where Blacks and Latinos became majorities in and around those cities. This is also true in the Mojave Desert and Coachella Valley portions. While the region as a whole had traditionally leaned more Republican than the rest of California, newer[when?] residents are less likely to identify with the Republican party than longer-term residents (36 percent to 42 percent), and the total number of residents identifying with the Democrats (34 percent) slightly edged over the number identifying with the Republican party (33 percent). Suburban communities outside Riverside and San Bernardino are more likely to be majority Republican, while the two mentioned cities are majority Democratic. In the 2008 presidential election, Democratic candidate Barack Obama carried both Riverside and San Bernardino counties, becoming only the second Democrat to carry both counties since Lyndon Johnson in 1964. In 2012, Obama repeated this feat and again carried both counties, and in 2016, Hillary Clinton did the same. Non-Hispanic Whites and non-Hispanic Blacks have the highest participation rates for nearly every type of political activity, while Latinos and Asian Americans lag significantly behind those groups in terms of volunteerism and organizational membership. However, the 2006 immigration protests have significantly boosted political participation among Latinos. Many faiths and denominations are found and represented in the area. The Roman Catholic parishes in the region belong to the church's Diocese of San Bernardino. Mormons and Seventh-day Adventists have communities in the towns of Loma Linda and Redlands near San Bernardino. 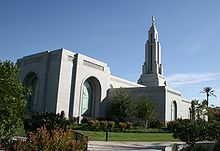 Mormons also have congregations in the High Desert region. Seventh-day Adventists operate Loma Linda University. The Inland Empire has a Jewish community, and additionally a Jewish American community is in and around Sun City which was later incorporated as the City of Menifee. According to the United Jewish Citizens of the Desert, the Coachella Valley has an estimated 20,000 American Jews, one of California's largest Jewish communities, as a result of being a major retirement destination. While the crime index in Riverside and Ontario trends slightly over the state average, San Bernardino has a crime index consistently near or over twice that of the national average. Reflecting nationwide trends, violent crime in the region overall declined or remained consistent in 2009, despite the recession. In the city of Riverside, 10 homicides occurred in 2005, down from 24 in 2003, its highest total since 2003. All but three cases resulted in arrests. In San Bernardino, by contrast, 58 killings occurred in 2005, but only a third of cases in San Bernardino led to arrests, due to a lack of witness cooperation in that city. Latino gangs have been active in the region since the area's citrus days while a continual migration of numerous African American gangs from the inner city of South LA have flowed into the region since the Watts Riots and 1992 Los Angeles Riots. The increased diversity in the region between 1990 and 2000 is also associated with a 20 percent increase in hate crime in the same period, mostly ascribed to increased gang activity. According to data from the FBI's Uniform Crime Reporting program, taken together, Riverside and San Bernardino counties showed a total of 51,237 crimes reported to county police/sheriffs (but not to city or other agencies) in 2006; this combined total exceeded the totals for all other California counties – considered individually – except for Sacramento. The region has also been noted as a center of methamphetamine drug production. The Riverside and San Bernardino county sheriffs' departments busted 635 meth labs in 2000; law enforcement has driven most of the meth production industry to Mexico since 2007, but many of the homes discovered to have been used as meth labs before 2006 have since been sold on the market before California law required rigorous decontamination, leading to a legacy of health hazards for unsuspecting renters and home-buyers in the area. In 2016 federal crime statistics stated that San Bernardino was ranked the most dangerous city in California. There is a trend of lower educational attainment in the IE, which starts early. Only 37 percent of 3- and 4-year-olds in the region are enrolled in pre-school, with only one school in the region for every 343 children, as compared with 48 percent enrollment in San Diego County. Thirty-five percent of the IE's ninth graders do not graduate from high school, and only 37 percent of its college age residents enroll in a post-secondary education program of some sort. Only 24 percent of the IE's adult residents have attained a college degree or better. Twenty-five percent do not possess a high school diploma. According to past CSUSB President Al Karnig, "We have a very low college attendance rate that is scantly above half of what the average is in other states. We have only have about 20 percent college graduates in the Inland Empire while the average in other states is 38 percent." 21 inland area high schools rank in the top 100 in California for producing dropouts. Of Inland Empire residents 25 years and over in 2004, 44.4 percent of Asians had bachelor's or higher degrees, and nearly 70 percent had at least attended college. 21.3 percent of Blacks had a bachelor's degree or higher, and 65.2 percent had either a community degree or had attended college. 22.8 percent of Whites had a bachelor's degree or higher, and 60.8 percent had attended college. Of Hispanics, 6.9 percent had a bachelor's or higher degree, and 30.2 percent attended college. Among students transferring from Inland community colleges to private schools in 2004–05, the most frequent choice was the University of Phoenix. While the Inland Empire led the state in job-growth with 275,000 new jobs between 1990 and 2000, most are in comparatively low-tech fields. San Bernardino and Riverside counties are primarily host to service and manufacturing- or warehousing-oriented industries. Food and administrative services employ the most people in the Inland Empire, while for the state of California, the top industries are in administrative services and professional, scientific and hi-tech-oriented fields. 79.8% of the IE's job growth from 1990 to 2003 was in service-sector jobs. Low-wage industries are abundant in the IE, and the area's high-tech and professional industries pay less than in other regions of California. As many as one-third of working adults commute out of the 27,000-square-mile (70,000 km2) region to find work, the highest proportion of any area in the country. Adding to gridlock, fewer than 5% of the IE's 1,249,224 working-age residents use public transportation to get to work each day. 14.5% carpool, while 79.7% typically drive alone to work in their cars. In 2007, the region had an unemployment rate of 6.1%, while overall jobless claims in California were at 5.4% and 4.4% nationally. In 2008, unemployment in the area increased to 9.5%, at a time when the state average was 8.2% and the national average approximately 6.5%. Unemployment reached an all-time high of 15% in 2010, second in the nation only to Detroit among metropolitan areas with populations over 1 million. The Inland Empire sits adjacent to the San Bernardino Mountains. Lake Arrowhead and Big Bear are just some of the lakes located in the mountains. Lake Arrowhead becomes very popular in the summertime, while Big Bear becomes popular in the winter for skiing and snowboarding activities. Various locations in the Inland Empire provide venues for cultural performances and entertainment. The Victoria Gardens Cultural Center, which is owned and operated by the City of Rancho Cucamonga, opened in the Fall of 2006 providing theatre, concerts and family entertainment to the region. 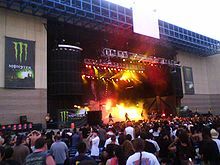 The San Manuel Amphitheater in San Bernardino's Devore neighborhood is the nation's largest outdoor amphitheater. San Bernardino's "Route 66 Rendezvous (the largest classical carshow in the US)," an annual street fair and classic car show, draws a half-million people from around the world. The Palm Springs Aerial Tramway in Palm Springs is a popular attraction, rising to more than 8500 feet. At 330 feet (100 m) high, the Morongo Casino, Resort & Spa tower is the tallest building in the Inland Empire. Concerts and events are booked inside. Established bands from the IE include Alien Ant Farm, The Bellrays, and the Voodoo Glow Skulls, from Riverside, and Cracker from Redlands, and The Mountain Goats From Chino. House music artist DJ Lynnwood got his start at the age of ten spinning records at KUOR-FM in Redlands. girafa is another local electronic artist from Corona, CA. Local hip-hop artists such as Miah Lanski, Suga Free, Saint Dog, 40 Glocc, Young Noble from the Outlawz, J.J. Fad, Raje, Noa James, Xydewayz8, The Faze, Lil Xan and A Lighter Shade of Brown have brought about attention to the growing Hip hop community in and around the region. The Jerkin' street dance culture originated from the Inland Empire-based hip-hop groups New Boyz and Audio Push. A number of artists associated with the Palm Desert Scene forged the genre of desert rock as well as playing a large role in the genre of stoner rock. A Danish record label, Musikministeriet, recently opened up an office in Redlands in hopes of further cultivating the IE music scene. Frank Zappa performed in Upland on Foothill Boulevard during the early 1960s where he played shows on a makeshift stage for college crowds. Zappa also purchased Pal Recording Studio on Archibald Avenue in Rancho Cucamonga where the Surfaris had recorded the surf music classic "Wipe Out." He dubbed it Studio Z and began making recordings which eventually led to the founding of Zappa's group, The Mothers of Invention. Up until his death in December 2012, singer Ray Collins of the Mothers of Invention lived in the area. Zappa mentions the Inland Empire in the song "Billy the Mountain." From the late 80s until the late 90s, many up-and-coming musical acts, such as Rage Against the Machine, Blink-182 and No Doubt cut their teeth playing venues in Riverside. However, these historic venues (Spanky's Cafe, and the De Anza Theatre) have since been closed and converted to other purposes. The Barn at UCR was closed as a music venue for 10 years but beginning in October 2008 KUCR Radio 88.3 FM, ASPB The Associated Student Program Board with funding from UCR Housing began having a free concert series once a week during the school quarter. Emerging music venues in the IE include the Showcase Theatre in Corona (recently closed), Red Planet Records in Riverside, the Vault in Redlands, the Buffalo Inn and The Wire in Upland, the Twins Club in Rancho Cucamonga, the Press Restaurant in Claremont, the Glass House in Pomona, Back To The Grind Coffee Shop in Riverside, Liam's Irish Pub in Colton, and CommonGround Soundstage in Riverside. California Theatre in downtown San Bernardino. Orchestras in the IE include the Redlands Symphony, which performs at the University of Redlands, the Riverside County Philharmonic, which performs at the Riverside Municipal Auditorium, the San Bernardino Symphony, which performs at the California Theatre, and the Victor Valley Symphony, which performs at Victor Valley College. Theatrical Arts International is housed at the California Theatre as well. With the largest subscriber base in the Inland Empire, Theatrical Arts International presents the largest caliber tours available including such blockbusters as Cats, Hairspray, Mamma Mia, and Miss Saigon. There are many other large theater programs in the community. The Riverside Fox Theater, also known as the Fox Performing Arts Center, was built in 1929, and is a Spanish Colonial Revival style building in the heart of downtown Riverside, California. The theater is the centerpiece of Riverside's Arts & Culture initiative and underwent a major renovation and restoration to become a regional performing arts facility. Renovation was completed in the Fall 2009, with a grand-reopening in January 2010. At Chaffey High School in Ontario, they have a very large theater program that puts on shows in the fall and in the spring on one of the largest High School stages in the Inland Empire. The Inland Empire Harmony Carousel Chorus provides music in Barbershop Quartet productions. Inland Empire 66ers playing at San Manuel Stadium in downtown San Bernardino. The Inland Empire is home to numerous minor league baseball, basketball, and ice hockey teams. The Inland Empire team with the most championships is the Inland Empire 66ers of San Bernardino, who won their most recent championship in 2013. The Auto Club Speedway, located in Fontana, opened in 1997. It contains an oval, a road course, and a dragstrip for auto racing. The Speedway is located approximately 2 miles (3.2 km) from the former Ontario Motor Speedway site. The Riverside International Raceway, another defunct motorsport venue, was located about 7 miles (11 km) east of Riverside. The InlandEmpirePress.com provides online only reporting for the Riverside County & San Bernardino Valley region. The San Bernardino County Sun, which serves primarily the San Bernardino Valley region. The Inland Valley Daily Bulletin, which serves the southwestern San Bernardino County and eastern Los Angeles County cities of Claremont, La Verne, Pomona, San Dimas, Upland, Rancho Cucamonga, Ontario, Montclair, Chino and Chino Hills. The Riverside-based Press-Enterprise also has a few editions over the area. Inland Empire: The Inland Empire Community News, provides online and print reporting for various cities in the Inland Empire. High Desert: the Victor Valley is served by both the Victor Valley News and the Daily Press. Other newspapers include the Antelope Valley Press, and the Barstow Desert Dispatch. Both Victorville and Barstow have a Sunday edition circulated across both areas called the Press-Dispatch. The Inland Empire is ranked 26th (June 2008) in the national radio market as a stand-alone market. When combined with the Greater Los Angeles Area, it is part of the second largest radio market. Due to the various mountain ranges including San Bernardino, San Gabriel, and Idyllwild, it may be difficult to receive a single station throughout the entire Inland Empire area without interference. PBS member station KVCR-TV broadcasts directly to the Inland Empire. The station covers all of Riverside County and San Bernardino County with some Los Angeles area overlap. The station is located on the campus of San Bernardino Valley College. In addition to PBS and original, local content, First Nations Experience (FNX), KVCR's sister station, also broadcasts programming about the indigenous peoples and Native Americans to the Inland Empire. The current TLC TV series Dr. Pimple Popper, a spin-off of the YouTube channel of dermatologist Sandra Lee, is shot mainly at Skin Physicians & Surgeons, a clinic in Upland run by Lee and her husband Jeffrey Rebish, also a dermatologist. While there are no large film production companies or studios based in the Inland Empire, on-location shoots accounted for a total economic impact of $65.2 million in the two-county region in 2006. From 1994 to 2005, filming accounted for over a billion dollars ($1,228,977,456) in total revenues spent in the area. Some famous films shot in the Inland Empire include Executive Decision, U Turn, Erin Brockovich, and The Fast and the Furious. While the 2006 David Lynch film Inland Empire is named after the region, no scenes were actually shot in the Inland Empire. Internet media and blogs are quickly gaining traction in the Inland Empire as newspaper readership has been falling. Some entertainment blogs include Things To Do Inland Empire, DiscoverIE.com, JooseBoxx.com, InlandDaily.com, and InlandEmpire.com. Politics has also received coverage on the web, with iepolitics.com providing an outlet for political bloggers. Ann Lerner, Albuquerque's film liaison, told the L.A. Times about the AMC cable TV series Breaking Bad producers wanted to film the series in California's Inland Empire but switched to New Mexico because of New Mexico's tax incentives. ^ "Annual Estimates of the Population of Metropolitan and Micropolitan Statistical Areas: April 1, 2000 to July 1, 2008". U.S. Census Bureau. Archived from the original on November 17, 2011. Retrieved March 22, 2009. ^ a b c d e f Rosenblatt, Susannah (November 27, 2006). "'Inland' for sure, 'Empire' maybe: Where's the boundary?". Los Angeles Times. ISSN 0458-3035. Retrieved July 8, 2009. ^ "Annual Estimates of the Population of Combined Statistical Areas: April 1, 2000 to July 1, 2010". 2006 Population Estimates. U.S. Census Bureau, Population Division. April 7, 2010. Archived from the original (CSV) on September 14, 2007. Retrieved December 2, 2007. ^ Wagner, Rob Leicester. "Sleeping Giant: An illustrated history of Southern California's Inland Empire". Stephen's Press, LLC, 2005. ISBN 1-932173-07-2. ^ Giovannini, Joseph (July 7, 1985). "An inland empire built on oranges". New York Times. ISSN 0362-4331. Retrieved July 8, 2009. ^ a b "History timeline of the Inland Empire, California". San Bernardino County Sun. October 30, 2007. Archived from the original on December 14, 2007. Retrieved November 15, 2007. ^ a b Ruther, Walter; Calavan, E. Clair; Carman, Glen E. (1989). "The Origins of Citrus Research in California" (PDF). The Citrus Industry. Oakland: Division of Agriculture and Natural Resources, University of California. V (Chapter 5). Archived from the original (PDF) on August 8, 2007. Retrieved August 21, 2007. ^ a b Petrix, Mark (October 30, 2007). "From two orange trees Sprang an Empire". Daily Bulletin. Archived from the original on March 24, 2008. Retrieved November 15, 2007. ^ Sorba, Michael (October 30, 2007). "Rails reach the Inland Empire". Daily Bulletin. Archived from the original on December 8, 2007. Retrieved November 27, 2007. ^ Mydans, Seth (August 26, 1993). "With a Boom in the Desert Over, Transplants Are Feeling Stranded". New York Times. ISSN 0362-4331. Retrieved July 8, 2009. ^ Rundel, Rhonda (October 7, 2008). "California Officials Try to Avoid Second Housing Hit". Wall Street Journal. Dow Jones & Company, Inc. pp. A8. ISSN 0099-9660. Retrieved July 23, 2009. ^ Howard, Bob (October 2, 2001). "Building on Ontario's Success". Los Angeles Times. ISSN 0458-3035. Retrieved July 8, 2009. ^ a b Flanigan, James (January 15, 2009). "Businesses Find a Silver Lining in Inland California's Downturn". New York Times. ISSN 0362-4331. Retrieved July 8, 2009. ^ "Where is the IE? - About - The Inland Empire Business Atlas". business.redlands.edu. Archived from the original on April 20, 2010. Retrieved September 18, 2015. ^ a b Mian, Lal S. (December 2000). Inland Empire Environmental Quality Paradigm (PDF). San Bernardino: Department of Health Science and Human Ecology, California State University, San Bernardino. Archived from the original (PDF) on September 9, 2006. Retrieved December 16, 2007. ^ a b Lopas, Matthew (July 12, 2004). "Some Flee 'the 909' to a New Area Code". Los Angeles Times. Tribune Company. pp. B–1. ^ Sahagun, Louis (August 11, 1988). "L.A. Gangs, Drugs Invade Inland Empire". Los Angeles Times. ^ Semuels, Alana (December 18, 2010). "California's recovery might not mean a robust job market". Los Angeles Times. ^ Semuels, Alana (August 9, 2010). "Where recession's effects are magnified". Los Angeles Times. ^ Hirsch, Jerry (January 9, 2006). "Dairies Moving Out of Inland Empire". Los Angeles Times. ^ Willon, Phil (January 20, 2008). "Inland Empire ballot guide". Los Angeles Times. ^ Welcome to the California Tourism Industry Website Archived November 27, 2010, at the Wayback Machine. Tourism.visitcalifornia.com. Retrieved on 2013-08-17. ^ Cal.gov. "CA.Gov State of California: About – Region Maps". State of California. Archived from the original on January 30, 2011. ^ Starr, Kevin. Golden dreams: California in an age of abundance, 1950–1963. Oxford University Press 2009. ^ See, e.g., Harris, David Money and Harris, Jennifer Money. Afoot and Afield Inland Empire. Wilderness Press 2009. ^ See also Cortes, Carlos E. "CHICOP: A Response to the Challenge of Local Chicano History". AZTLAN – Chicano Journal of the Social Sciences and the Arts. vol.1, n.2 1970. ^ Kirkham, Chris (April 17, 2015). "Inland Empire sees surge in warehouse jobs, but many are low-pay, temporary". Los Angeles Times. ^ Vincent, Roger (November 15, 2007). "Inland Empire warehouse deals". Los Angeles Times. Retrieved December 1, 2007. ^ Pitchford, Phil; Miller, Jim (November 28, 2007). "$1.7 billion allotted to five-county region for highway, rail projects". Press Enterprise. Archived from the original on July 5, 2008. Retrieved December 1, 2007. ^ Vincent, Roger (February 3, 2009). "Boom in Inland Empire industrial space is beginning to go bust". Los Angeles Times. ISSN 0458-3035. Retrieved July 8, 2009. ^ a b c Kelly, David (April 10, 2008). "Inland Empire's growth to continue". Los Angeles Times. ISSN 0458-3035. Retrieved July 8, 2009. ^ Top 50 US Metro Areas by Gross Metropolitan Production (Economic Output) Archived May 9, 2013, at the Wayback Machine. Shnugi (2011-09-25). Retrieved on 2013-08-17. ^ Horseman, Jeff (18 August 2012). "REGION: Inland welfare, food stamp usage soars". Press-Enterprise. Retrieved 20 August 2012. ^ Conference Transcripts (2005). "Smart Growth on the Edge: Suburban Planning and Development for the Next 20 Years". Opolis: an International Journal of Suburban and Metropolitan Studies. Berkeley and Oakland: bepress and eScholarship Repository, California Digital Library. 1 (2): 62–68. Retrieved December 17, 2007. ^ Gould, Scott (October 18, 2002). "Swallowed by Sprawl". Los Angeles Times. ISSN 0458-3035. Retrieved July 8, 2009. ^ "MEASURING SPRAWL AND ITS IMPACT, The Character & Consequences of Metropolitan Expansion". Smart Growth America. 2002. ISSN 0458-3035. Archived from the original on October 31, 2002. Retrieved July 8, 2009. ^ Kelly, David (October 30, 2008). "Inland Empire economic outlook is grim". Los Angeles Times. ISSN 0458-3035. Retrieved July 8, 2009. ^ Berkman, Leslie (March 11, 2010). "Fewer foreclosures despite mortgage trouble". Press-Enterprise. Archived from the original on March 13, 2010. Retrieved March 11, 2010. ^ a b c d e Husing, John (October 2007). "Inland Empire City Profile 2007" (PDF). Inland Empire Quarterly Economic Report. Redlands: Economics & Politics, Inc. 19 (4). Archived from the original (PDF) on February 27, 2008. Retrieved December 1, 2007. ^ Oversight Field Hearing, Committee on Resources, US House of Representatives (September 10, 2004). "Examining Impacts of the Endangered Species Act on Southern California's Inland Empire" (PDF). One Hundredth Eighth Congress, Second Session. Washington, D.C.: U.S. Government Printing Office. Retrieved December 17, 2007. ^ Newell, Jason (November 11, 2006). "Inland Empire faces challenges, opportunities in years ahead". San Bernardino County Sun. Retrieved November 26, 2007. ^ Supryia, Ray (2006). Plagued by Pollution: Unsafe Levels of Soot Pollution in 2004 (PDF). Los Angeles: Environment California Research & Policy Center. Archived from the original (PDF) on October 29, 2007. Retrieved December 16, 2007. ^ Pesick, Jason (December 4, 2007). "Rialto seeks Superfund designation for perchlorate". Press Enterprise. Archived from the original on February 14, 2009. Retrieved December 16, 2007. ^ Van Dusen, Alison (November 26, 2007). "America's Unhealthy Commutes". Forbes. Retrieved December 9, 2007. ^ Larry, Gordon (March 9, 1999). "Inland Empire Leads in Fatal Road Rage". Los Angeles Times. ISSN 0458-3035. Retrieved July 9, 2009. ^ "Aggressive Driving: Where you live Matters". Surface Transportation Policy Project. April 1, 1999. Archived from the original on October 4, 2009. Retrieved July 9, 2009. ^ Kelly, David (April 30, 2008). "Thefts of copper, brass and other metals hit Inland Empire freeways". Los Angeles Times. ISSN 0458-3035. Retrieved July 8, 2009. ^ Hennessy-Fiske, Molly (September 25, 2008). "Gas siphoning a growing problem in Inland Empire". Los Angeles Times. ISSN 0458-3035. Retrieved July 8, 2009. ^ a b c d Tornatzky, Louis; Barreto, Matt A. (2004). Economic Development and the Knowledge Economy in California's Inland Empire: Progress or Stagnation? (PDF). Los Angeles: Thomás Rivera Policy Institute, University of Southern California, School of Policy, Planning, and Development. Archived from the original (PDF) on October 11, 2007. Retrieved November 10, 2007. ^ About sbX Archived August 23, 2013, at the Wayback Machine. Estreet-sbx.com. Retrieved on 2013-08-17. ^ Begley, Doug (March 22, 2012). "Trail making progress, and impression on users". The Press Enterprise. Retrieved May 15, 2012. ^ Leung, Wendy (2011-12-07). "Officials dedicate new bridge carrying the Pacific Electric Trail over Foothill Boulevard". Daily Bulletin. Retrieved May 15, 2012. ^ Bockman, Shell; Neiman, Max; Sirotnik, Barbara (2001). 2001 Inland Empire Annual Survey (PDF). San Bernardino: Inland Empire Research Consortium. Retrieved December 17, 2007. ^ Ramakrishnan, Karthick (July 2007). Survey of Civil and Political Engagement in the Inland Empire (PDF). Riverside: Department of Political Science, University of California, Riverside. Archived from the original (PDF) on February 27, 2008. Retrieved November 27, 2007. ^ Welcome to the Diocese of San Bernardino. Sbdiocese.org. Retrieved on 2013-08-17. ^ Loma Linda University. Llu.edu (2009-06-01). Retrieved on 2013-08-17. ^ Contact Us Archived August 28, 2012, at the Wayback Machine. Jewishfederations.org. Retrieved on 2013-08-17. ^ "San Bernardino, California, Detailed Profile". City-Data.com. Retrieved November 24, 2007. ^ "Riverside, California, Detailed Profile". City-Data.com. Retrieved November 24, 2007. ^ "Ontario, California, Detailed Profile". City-Data.com. Retrieved November 24, 2007. ^ Rogers, Robert (November 27, 2007). "Experts advise SB leaders on parolees". San Bernardino County Sun. Retrieved November 27, 2007. ^ Larocco, Paul (January 8, 2010). "Inland's largest cities log lower or near-identical killing totals in 2009". Press Enterprise. A. H. Belo. Archived from the original on September 7, 2012. ^ Matthews, Will (September 26, 2004). "Roots of youth violence". San Bernardino County Sun. Archived from the original on October 28, 2007. Retrieved November 27, 2007. ^ Holthouse, David (Fall 2005). "California Conflict". Intelligence Report. Southern Poverty Law Center. Archived from the original on March 21, 2008. Retrieved November 27, 2007. ^ Silva, David (May 3, 2007). "War on Hate, Brian Levin and the changing face of extremist groups in the IE". Inland Empire Weekly. Retrieved December 12, 2007. ^ Shafer, Jack (August 4, 2005). "The Meth Capital of the World, Where is it?". Slate. The Washington Post Company. Retrieved April 30, 2009. ^ Quan, Douglas; Jose Arballo Jr. (May 16, 2008). "METH'S LEGACY: Most drug labs may be gone from the Inland area, but the contamination remains". Press Enterprise. A. H. Belo. Archived from the original on October 10, 2008. Retrieved April 30, 2009. ^ Kennedy-Ross, Selicia (October 17, 2007). "What's in the future for I. E. universities?". San Bernardino County Sun. Retrieved October 20, 2007. ^ An, Caroline (November 10, 2006). "Inland Empire college-going rate among California's lowest". San Bernardino County Sun. Retrieved November 25, 2007. ^ Parsavand, Shirin (February 21, 2008). "21 Inland schools rank in top 100 for dropouts". Press Enterprise. Archived from the original on February 14, 2009. Retrieved February 21, 2008. ^ Husing, John (July 2006). "Inland Empire's Growing Diversity" (PDF). Inland Empire Quarterly Economic Report. Redlands: Economics & Politics, Inc. 18 (3). Retrieved December 1, 2007. ^ Regus, Elaine (December 31, 2007). "Inland Higher Education Notes". Press Enterprise. Archived from the original on February 14, 2009. Retrieved December 31, 2007. ^ Husing, John (January 2004). "New Data provide detailed look at Inland Empire's Looming Strengths & Difficulties" (PDF). Inland Empire Quarterly Economic Report. Redlands: Economics & Politics, Inc. 16 (1). Archived from the original (PDF) on February 27, 2008. Retrieved December 1, 2007. ^ Brown, Josh (November 16, 2007). "Inland job growth remains steady in October, according to state". Press Enterprise. Retrieved November 25, 2007. ^ Pierson, David (November 22, 2008). "Surge in unemployment puts California's Inland Empire in tailspin". Los Angeles Times. Tribune Company. Retrieved December 19, 2008. ^ Katzanek, Jack (March 11, 2010). "Unemployment rate hits record high". Press-Enterprise. Archived from the original on March 14, 2010. Retrieved March 11, 2010. ^ "Things To Do Inland Empire". February 10, 2011. Retrieved February 10, 2011. ^ Weeks, John (November 10, 2006). "Inland Empire – a pop culture bastion". San Bernardino County Sun. Retrieved December 17, 2007. ^ Flansburg, Darcie (September 21, 2006). "Musikministeriet, new music label in town". Redlands Daily Facts. Archived from the original on March 21, 2008. Retrieved December 11, 2007. ^ Franko, Vanessa (September 21, 2007). "Riverside record shop turns the tables". Press Enterprise. Archived from the original on February 14, 2009. Retrieved December 11, 2007. ^ Novick, La Rue (May 17, 2005). "Oh what a night". Inland Valley Daily Bulletin. Archived from the original on March 24, 2008. Retrieved December 11, 2007. ^ THE 66ERS ARE CALIFORNIA LEAGUE CHAMPIONS milb.com by Sam Farber / Inland Empire 66ers. ^ "Radio and Records: Ratings". Archived from the original on March 21, 2008. Retrieved June 20, 2008. ^ Copelton, Melissa (July 12, 2018). "For YouTube Star Dr. Sandra Lee, Pimple Popping Runs in the Family!". In Touch Weekly. Retrieved August 11, 2018. ^ Davis, Sherri (January 2007). "Economic Impact Report" (PDF). Film Inland Empire News. Riverside: Inland Empire Film Commission. 2 (1). Archived from the original (PDF) on February 27, 2008. Retrieved November 25, 2007. ^ "Things To Do Inland Empire". February 10, 2011. Retrieved December 24, 2011. ^ "DiscoverIE.com". December 24, 2011. Retrieved December 24, 2011. ^ "JooseBoxx.com". May 31, 2013. Retrieved May 31, 2013. ^ "InlandDaily.com". July 31, 2013. Retrieved July 31, 2013. ^ "InlandEmpire.com". January 30, 2013. Retrieved January 30, 2013. ^ "iepolitics.com". December 24, 2011. Retrieved December 24, 2011. ^ John M. Glionna (January 31, 2014). "Column One: 'Breaking Bad' is still cooking in Albuquerque". Los Angeles Times.